It's tricky to remark on how amazing it is that Erich von Däniken is still writing prolifically in his 80s, without sounding just a bit patronising. Nowadays, his books feel like extended letters sent from his mountain home in Switzerland. He's still analysing, arguing, questioning, probing. He bangs the same old drum, of course, but brings into the mix the newest scientific research, and the latest progress on the long, tortuous path towards disclosure. This helps to keep his newer books fresh and up-to-date. 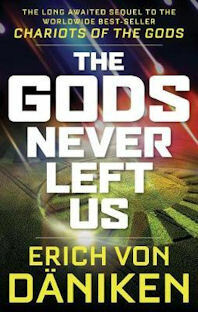 Erich von Daniken's early work has spawned a media phenomenon in the form of the successful 'Ancient Aliens' TV series. By comparison, books must seem a quaint anachronism from the point of view of the newer generations. But I appreciate them, being a bit of an old hand myself, and I'm glad he's still writing them! This particular instalment kicks off with a fictional short story involving CERN and time travel, and the desire to be listened to by the gatekeepers of Knowledge. It would be too easy to psychoanalyse this short story and place von Däniken in the role of the central protagonist. It's a curious thing to include in a non-fiction book, but, as with all von Daniken's writing, it is enjoyable to read and engaging. If there is a theme running through the book, it is signs from above. 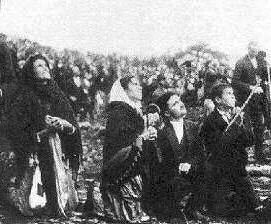 The Fatima sightings set the scene, dealt with briefly here. I suppose that the October 2017 event near Fátima, Portugal, which is held dear by the Roman Catholic Church, would be interpreted as a Close Encounter of the Fifth Kind by modern ufologists, in the sense of being a pro-active, human-initiated event involving a UFO-related phenomenon. The worldwide phenomenon of crop circles have similarly historic precedents, as von Däniken points out, writing with his usual mix of common sense, logic and passion. He seems convinced that some are 'real'. He riffs seamlessly about UFOs and disclosure. Who should the aliens contact? He argues that it would be difficult for an advanced civilisation from the stars to avoid meddling in our affairs if they chose to align themselves with individuals, governments, organisation or corporations. Instead, they make contact with secret agencies, working behind the scenes, to prepare open disclosure (p48). The UFO manifestations in the sky pave the way by creating modern urban myth among the public (von Däniken is evidently an advocate for UFO reality, albeit with sensible provisos, particularly regarding some of his fellow proponents in that field). The author makes a nice analogy with humans observing ant colonies. If we study them closely enough, we might notice the inter-colony warring, the disasters, the sheer efforts to remain resilient in the face of all challenges. Yet, despite our curiosity and wonder at the social structure of the colonies, we would have little or not interest in intervening in the affairs of one of more of these colonies, over and above the others. They are, after all, just ants. Ants might have some awareness of humans, in an environmental sense, but we would not expect them to consider why we don't intervene in their affairs, or attempt to make some kind of meaningful contact. The blocking piece in this argument, of course, is sentience. But the underlying logic is sound, and you can quite see how an intelligence well beyond ours might behave in the same manner towards us. The book then moves back in time, back to ancient alien contact. The strongest chapter in the book, I think, is Chapter 4, which takes on comparative myth, and draws upon planetary science and astronomy. There is much Greek mythology here, amid references to comparative myths and writings across the globe. It would be unfair of me to criticise von Däniken for not including a wealth of evidence in these pages, as he has written over 40 books now, and covers a great deal of material across that corpus. But it does seem like light treatment in these pages as we whizz from one continent to another. I was struck, as ever, by his discussion of ancient Mesopotamia. He again describes the writings of Dr Hermann Burgard (p109) (see EVD's earlier 'Remnant of the Gods', pp121-2), but not the late Zecharia Sitchin. Intervention in our genetics is another running theme of this book, after all, but von Däniken seems careful to avoid couching this in more specific Sitchinite terms. Perhaps it is the Planet X aspect of the other author's writings that prevent a reference, or even recognition (it seems politics is never that far away, even in 'ancient alien' circles.) Or maybe it's the issue of alien intervention with our hominin ancestors, which von Däniken seems sceptical of (p138); at least as this might appear within mythological narrative. Would Disclosure provide a wayward humanity with a new Enlightenment? Maybe. That kind of paradigm shift would be of similar proportion to the ascendance of reason over superstition in the 18th Century. But, regrettably, that Enlightenment is not so apparent in the final chapter of this book, which meanders into points about political correctness. It is enjoyable to read von Däniken sound off on ancient aliens and the like, but sometimes he reminds us that his strong opinions evoke tabloid hackery. This is a double-edged sword, as his literary recipe generally goes down well, and has struck a chord with generations of readers. As with von Däniken's ancient alien DNA, "c'est dans les genes".